AmericaShare’s headquarters is located in the heart of Mukuru at the Harambee Community Centre. 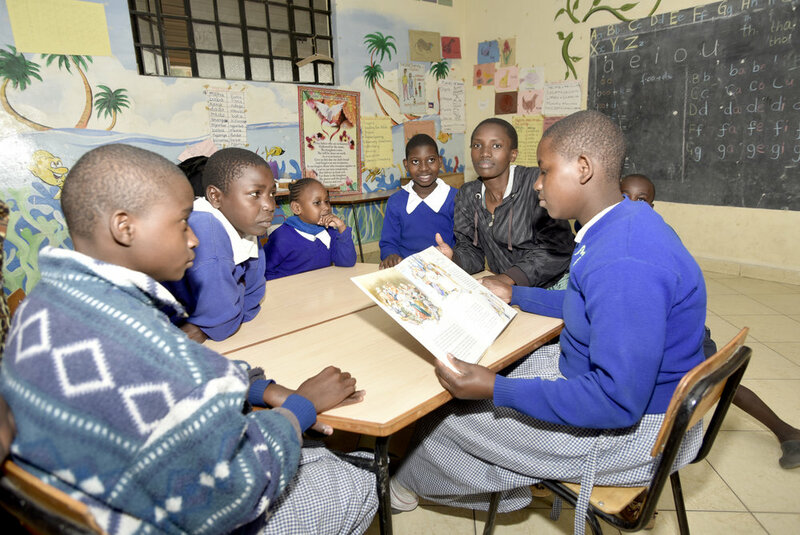 The centre provides an oasis of calm to the residents of Mukuru, and affords children a quiet place to study, learn and play away from the commotion and chaos of daily life in this impoverished area. Harambee Centre is home to our community outreach and education programmes. The library is stocked with over ten thousand books, including novels, textbooks, and study guides. Students of all ages use the library to do their homework, study for exams, and form study groups with their peers. Books are a rare gift in Mukuru. Many schools do not have adequate textbooks, and novels are a luxury most cannot afford. We also run educational sessions with local schools. The sessions engage younger students in lessons about their health and education through games and music. Additionally, we also host reading clubs at the centre to foster a love of reading amongst the children that frequent the library. These small group sessions allow students to discuss and express what they are learning in creative ways: through skits, short stories, and songs. Harambee’s Computer Centre, a beehive-busy annex to the Centre’s library, is designed to provide Mukuru’s residents with digital learning resources and internet connections for on-line study and job search. The computer centre, built with the support of Suzie and Bruce Kovner through The Kovner Foundation, houses computer workstations with internet access. An on-site computer technician conducts computer training and troubleshooting, coordinates computer access (which includes educational material consisting of Khan Academy videos, Wikipedia, and CK-12) and is an asset to our students. She helps students with everything from basic curiosity-quenching to advanced research, college prep, and job searches. Next to Harambee Centre is a nursery school where over a hundred little children ages 3 to 5 are cared for while their parents are working. AmericaShare pays for the children’s daily hot lunch so that they never go home hungry. Gorretti’s playground, the Baba Roland Celebratory Playground, was built in memory of a longtime AmericaShare sponsor, the late and cherished Roland Largay. In 2013 AmericaShare inaugurated its Virtuoso-Upchurch Learning Centre, dedicated to special needs children, gratefully named for the Virtuoso travel network and its CEO, Matthew Upchurch and his wife Jessica. The professionally staffed centre replaces a brave but hot and overcrowded classroom with an airy, modern new building. 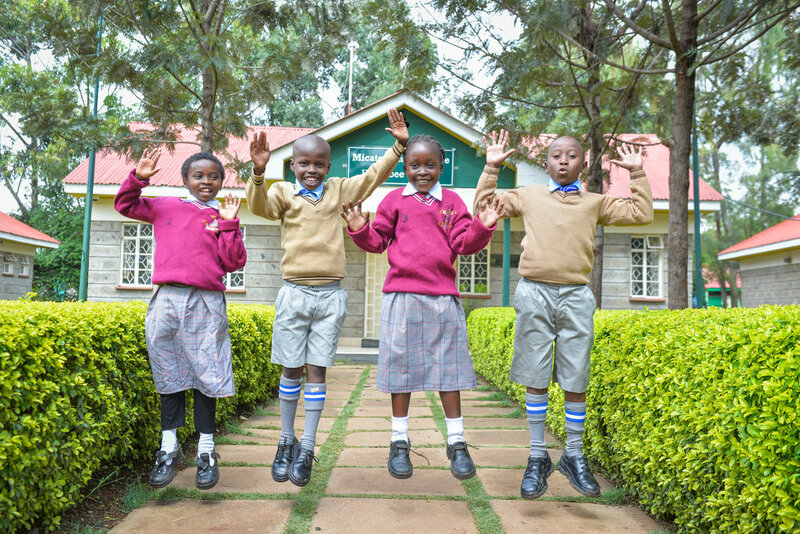 The new centre features bright wall murals, tiled floors, new desks and chairs, separate boys and girls bathrooms, specialized learning materials, and a small fenced courtyard which gives the children a pleasant and safe place to play and enjoy their lunch. Children with special needs have an especially difficult time in a developing country like Kenya. The Virtuoso-Upchurch Learning Centre is a refuge for these children, built to meet their specific needs. The game of Lacrosse was not played in Kenya until 2014, when Ian Macleod, funded by private donors, businesses, and the International Lacrosse Federation, introduced it to the Mukuru community. To date, over 200 students from local schools have regularly participated in practices and games. An AmericaShare School Sponsorship graduate student coaches students every day after school and coordinates matches every week. In December 2015, the Kenya Lacrosse Association was given the distinction of becoming the 54th member of the Federation of International Lacrosse. While not terribly glamorous, the borehole we dug next to Harambee Centre gives Mukuru one of its only sources of fresh water. Such are the small and day-to-day things that, along with libraries and computers and loving care, go into revitalizing a community.